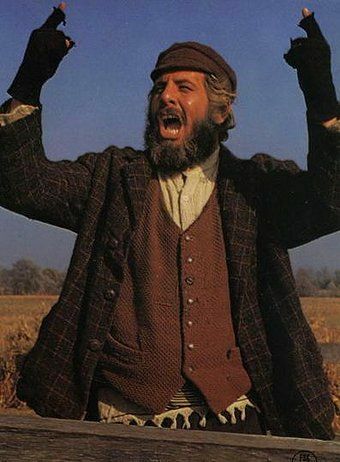 I recently watched Fiddler on the Roof again for the first time in many years. There is so much about this movie that truly moves me, and I was always one lump in the throat away from a sob for this recent viewing. While I’ve always had a great interest in the story, it’s themes are so relevant to my life right now, and I daresay, the world at large. The whole story revolves around a Jewish man and how he and his tight-knit community learn to adapt to the social and political changes of his day, and how these changes affect their traditions and way of life. Their Jewish traditions are closely kept as a way to maintain their culture and offer a sense of security in a very insecure world. The stubborn adherence to these traditions is something that has preserved the Jews as a people during centuries of displacement. For so long the Jews were scattered and left strangers in strange lands, having to deal with persecution and possible annihilation. Instead of simply assimilating into the cultures of the lands in which they’ve lived, they’ve desperately held onto their own culture and customs, always remaining a distinct people group. I’m certainly no history major, but I don’t know of any other people group that has been able to keep their cultural traditions through centuries of displacement, and then again reunite in their homeland. Whatever you believe about Israel, you have to admit that it’s pretty impressive the Jewish people have survived, and you have to feel at least a little bit happy for them now that they have a home and land to call their own. Traditions are, in so many ways, what defines a culture. They give a group it’s identity: This is how we think, believe, and behave; these are the rules, and they define us. But there also comes a point when each of us has to question the traditions we’ve been raised with. We have to examine the beliefs we’ve built our entire world and identity upon. This examination may come about due to illness, loss, or being confronted with our constantly changing culture. The problem is that many of us don’t want delve into such examination because it threatens our very sense of stability and security. Never before has the struggle of the Jewish character Tevye been so relatable for me. (Spoiler alert) Each of his eldest three daughters challenges the traditions of their people in different ways, and he learns to adapt to these changes with his first two daughters. But when it came to his third daughter, he found he could not bend any further or he would break. She married a Christian and this was absolutely unthinkable, one of the worst violations of their customs. What does Tevye do when confronted with this break in tradition? After considering the options and “other hands” of the matter as he usually does, he finally stands his ground and yells, “There is no other hand!” He turns his back on his daughter, walking away as she cries and begs him to accept her. From this day on, she is dead to him. When the traditions and beliefs that you’ve built your entire life upon are ripped out from underneath you, for whatever reason, it can be incredibly terrifying. Unless you’ve been through it, you have no idea how horrible an experience it is to feel that you have lost your identity. I went through such a major crisis last year, and I am still struggling to find my feet. What do I build my life upon now? How do I form an identity? For the love of God, WHO AM I??? As I watched Fiddler on the Roof again, I contemplated my own struggles, and came to a new understanding of the older generations. The youth are always full of change and fresh ideas, and they are often defied by their elders who believe the current order of things is best and should not be messed with. When watching this film again, I developed a new compassion for those “stubborn old people”. They are trying to protect their identities and sense of self. Even though some of the foundation stones of these identities are made of what most of us would consider evil ideas (misongyny, racism, discrimination, etc. ), I can’t help but feel compassion for these souls who’ve never experienced a different way. Because youth are inexperienced, and know only their strength and idealism, they push hard for change and don’t take much time to consider the wisdom and valuable experience of the old. They buck the system, absolutely intending to break it- and anyone who aligns with it. It’s ok to break corrupt systems, but I cannot help but wonder if there is a way to compassionately help others to bend with the changing winds, instead of leaving the naysayers to simply break. Youth generally want a more loving and accepting world, but unfortunately, too often turn aggressive towards those who appear to stand in the way, which in many ways defeats the entire purpose of their movement. Sometimes they end up becoming a new version of the evil they wish to annihilate. Compassion and understanding must go both ways. Each of us, whether young or old, must take the time to listen to and appreciate the struggles of one another if we are to survive the turbulence our current culture wars. We live in a volatile time of rapid social change and each of us is learning our place in the world, deciding which traditions to keep and which to discard. For many people, this is a very difficult journey. We must extend patience and grace towards those who struggle so deeply with these changes because there may come a day when our own foundations are shaken and we find ourselves slipping into sinking sands. We’re all on a journey, all wrestling with our inherited traditions in various ways. May God help us to choose kindness and forgiveness towards ourselves and our neighbors. For some reason I had never stumbled on this post until today (I have been trying to catch up on the backlog of your blog, in spite of my resistance to screen time, haha), and I love it so thoroughly I don’t even know how to…just…yeah. Words fail. But yours, above, did not. Thank you! This is actually one of my favorite posts. I’m not sure how much exposure it’s received, I will probably share it again from time to time.